That’s the advice that Marc Savard stresses to viewers in his YouTube videos where he recreates how various NHL players tape their hockey sticks. The long-time NHLer, who announced his retirement in January, is obsessed with the finer details of a tape job and was known to retape the sticks of teammates if he was displeased with how they prepared it for games. This leap into the world of YouTube was inspired by Savard’s Jan. 23 appearance on the “31 Thoughts” podcast with Jeff Marek and Elliotte Friedman. Savard told the story about how he would retape the sticks of former teammate Jason York. A few days later, he sent out a Tweet to his 57,000-plus followers asking if his they would want to watch a video of how he prepares his sticks. There was plenty of interest, and “Taping Twigs with Savvy” was born. “It’s amazing. We had no idea how this would ever go,” Savard told Pro Hockey Talk on Thursday. “Me and my wife just went upstairs in our game room one night and shot a video and 40,000 viewers later we decided to do another one. Now people are writing in what they want to see. As of Friday, Savard has over 4,500 subscribers to his channel and has made eight videos featuring the tape jobs of current players like Connor McDavid, David Pastrnak and William Nylander, and ex-NHLers like Mario Lemieux and his former New York Rangers teammate Wayne Gretzky. The sticks used are from his personal collection, which were acquired during his career or through connections he still has in the hockey world. The McDavid, for example, he received from Milan Lucic and there’s an incoming John Tavares stick, thanks to Johnny Boychuk. The increase in popularity has also earned Savard a sponsor in Howie’s Tape, who hopped onboard with the latest installment. The videos are simple. Savard takes the viewer through every roll of the tape job, from the knob to the shaft to the blade, and explains in detail the how and why of it all. The obsession dates back to his youth street hockey days when he would play goal. It wasn’t odd to find him in the basement painting his pads to get the right look. He’d focus on every aspect of his equipment, and eventually that attention shifted to his sticks, which continued as his hockey career took him to the NHL. • Keep the tape nice and tight — a phrase you’ll hear him say often — as you go around the stick. Make sure there are no crevices or wrinkles. • When you find yourself with excess tape around the toe, trim it neatly with sharp scissors. That can make or break a tape job, he stresses. Some of the tape jobs Savard saw up close and in person, like the Gretzky or Phil Kessel. Others are based off what he sees from watching a game on television. He picks up the finer details and is then able to recreate it as close as possible on the sticks in his collection. “I’m not always bang on but I’m definitely always very close if you ask players,” he says. It’s not just fans who are watching. Players check out Savard’s videos as well, according to some notes he’s received since his first video hit Jan. 29. The entire process is also a family affair. His wife films each episode while his son runs the YouTube channel. So whose hockey stick tape job does Savard admire these days? For one, he’s a fan of Artemi Panarin’s look, which he featured in episode two. 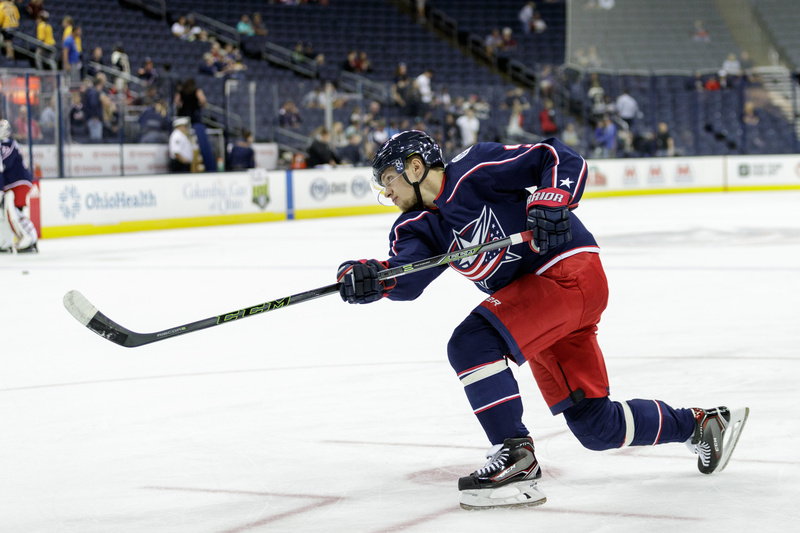 The Panarin, which is black tape along the blade and white tape on the toe, he also uses in men’s league. Then there’s Jamie Benn, whose tape job Savard likes because it’s simple, right on the middle of the blade, and Kessel’s for his candy cane look. When Savard announced his retirement in January, he also announced his desire to get into coaching, with junior hockey being his preferred starting point. There weren’t many gigs available in the middle of the season, so in the meantime he’s entered the world of broadcasting having appeared on Hockey Central at Noon on Sportsnet, Fan590 radio and he has a weekly spot on SirusXM’s The Power Play every Wednesday. “I’m kind of going in the broadcast direction right now in hoping that something jumps up for me in the coaching area,” he said. For now, Savard will continue answering requests and tape sticks in the fashion of current and former NHL stars. Maybe down the line he’ll get into other hockey gear-related topics, but he’s happy to share this passion with others and educate players and fans on the dos and don’ts of a fine tape job. It’s been seven years since Marc Savard last suited up as a player, but as he continues his recovery from concussions that ended his career he’s kept one regular routine from his playing days. “Not so much a set schedule, still a set nap. An hour and a half, two-hour nap at 12 o’clock — so I’ve kept that schedule alive,” Savard told Pro Hockey Talk on Wednesday. Savard officially announced his retirement this week following an 807-game NHL career with the New York Rangers, Calgary Flames, Atlanta Thrashers and Boston Bruins. He finished with 207 goals, 706 points and one Stanley Cup ring. A second concussion in less than a year forced him to miss the Bruins’ 2011 championship run, but the team successfully petitioned to have his name engraved on the trophy. Health-wise, Savard is doing great. “It’s the best it’s been in a long time,” he said. He’s staying active and keeping his mind occupied while spending plenty of time with his family. Part of what’s keeping Savard busy these days is coaching minor hockey in Peterborough, Ont. The experience behind the bench teaching kids, including his youngest son, Tyler, has inspired him to want to move up the ranks and into junior hockey. To find the biggest influence on Savard’s coaching spirit, you have to go back to his days with the Thrashers. Two months after he was dealt from Calgary to Atlanta, the team hired Bob Hartley as their new head coach. Fifteen years later, Savard still remembers Hartley’s impact. Hartley knew, even when he was coaching in Colorado, what kind of player Savard could be. In Atlanta, the head coach unlocked that potential, which helped Savard’s offensive game in his final season with the Thrashers and first year in Boston where he posted 97 and 96 points, respectively. Those lessons Hartley taught on the ice in Atlanta stayed with Savard as he entered the youth coaching world. He remembered the importance of communication; how there are numerous personalities to manage and how to find out the right buttons to push in order to get a player going. For example, Savard recalled Hartley being tough on Ilya Kovalchuk to improve his defensive game, while later showering him with praise after every goal. “It was really something to see and something that I’ve taken,” he said. Savard is a regular hockey watcher on television, especially when it comes to the Bruins. And now that he’s wearing a coaching whistle and track suit, you’ll often find him jotting down notes during games, picking out certain aspects of a power play or penalty kill that he liked. What does the future hold for Savard and could it involve an NHL return in a coaching capacity? He’s not thinking that far ahead and is just enjoying the moment. “We’ll see where this road takes me, but right now I’m really focused on the OHL or doing something with the younger age just to get some reps in and get used to being behind the bench a little more,” he said. Throughout the month of August, PHT will be dedicating a day to all 30 NHL clubs. Today’s team? The Florida Panthers. For the third season in a row, the Florida Panthers fell short of the playoffs. This time around, there were signs of moderate progress, as they finished 10th overall in the East with a 38-28-15 record (91 points). Final wild card team Pittsburgh finished seven points ahead of them, so there’s still work to do. For especially jaded fans, this may sound like a broken record, yet the team’s extreme mix of potential and experience could make for intriguing results. At one end, you have veteran star power with Jaromir Jagr and Roberto Luongo. They even have Brian Campbell for one more year, as his oft-cited $7.14 million cap hit will expire after 2015-16. On the other end, a bountiful crop of young players earned from all these years of underwhelming play. Aaron Ekblad won the 2015 Calder Trophy, while this year’s first-rounder Lawson Crouse may also make an immediate impact. Nick Bjugstad, Aleksander Barkov and Jonathan Huberdeau are all showing varying degrees of promise. Bjugstad’s the oldest of these young players, and he’s just 23. Expectations should climb in Gerard Gallant’s second season as head coach, at least from those who are paying attention to a team that frequently slips under the radar. For the most part, the Panthers stayed idle in free agency, either letting veterans walk (Tomas Kopecky) or shoving them out the door (Brad Boyes). Perhaps re-signing Jagr constitutes their “big splash,” then? They did make one eyebrow-raising move in adding Marc Savard’s contract in a deal that sent Jimmy Hayes to the Boston Bruins for Reilly Smith. Florida seems content with letting its young players continue to grow alongside Jagr and Luongo. Don’t be surprised if Marc Savard’s contract is traded, a la Chris Pronger to Arizona. Bruins GM Don Sweeney confirmed today that he’s spoken to a few teams about a transaction that would clear Savard’s $4 million cap hit (through 2016-17) off Boston’s books, and put it on a team that could perhaps use it. The challenge for Sweeney in trading Savard is that, after Pronger was dealt to Arizona, there isn’t really a team that’s in serious jeopardy of not reaching the $52.8 million cap floor for next season. Sweeney also took the opportunity to insist that goalie Tuukka Rask is “absolutely…not on the market,” despite the speculation.